I’ve come a long way in my pizza journey to slowly appreciating the Neapolitan style, having consumed mostly American style pizzas, I’m used to my base being firm. 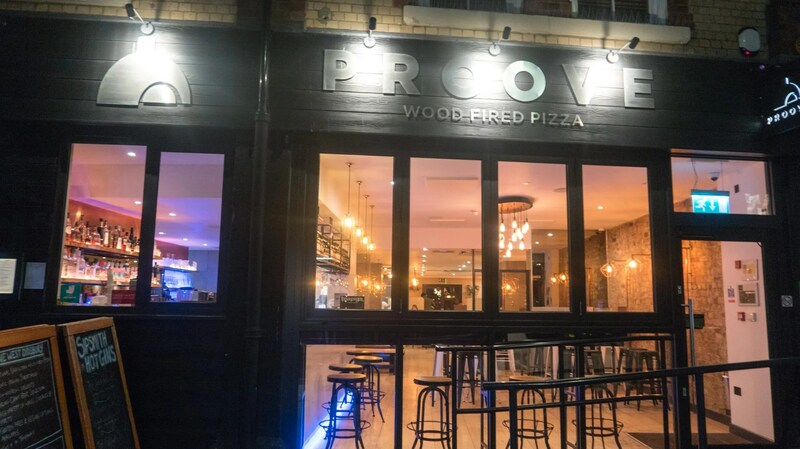 I tried Proove’s pizza in the past at the Manchester Food and Drink Festival, and wasn’t impressed by it at the time. When they invited me to try their pizzas again, I welcomed the opportunity to give them another shot. Proove is easy to find as it’s located on a main road. The interior is comfortable with plenty of lighting and wood furniture. An open kitchen allows you to see the chefs at work. 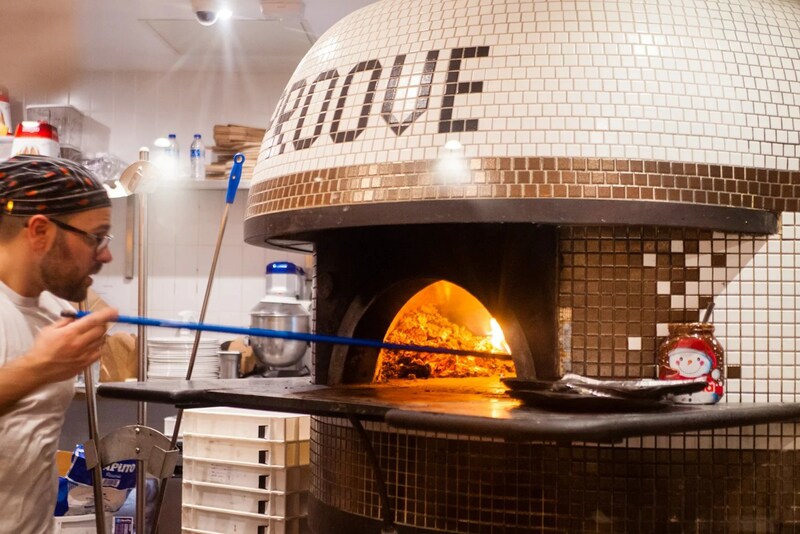 We were lucky that our table gave us a prime view of the pizzas going in and out of the oven. I decided to go for mocktails this visit and at £4.50 per glass, it’s cheaper than a cocktail! 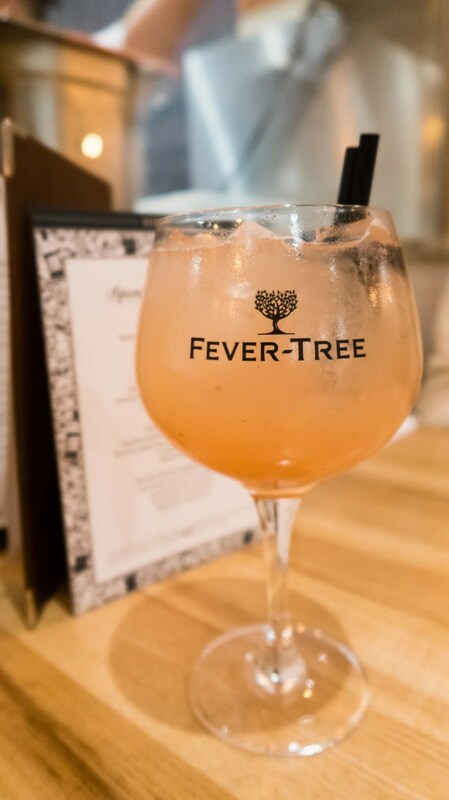 The Apple and Ginger Fizz immediately has my attention as I love anything with a strong ginger taste. Fresh blueberries are shaken with cloudy apple juice and then topped with ginger beer. It tastes exactly as described and was quite refreshing. My friend went for the Mango and Passionfruit Collins. 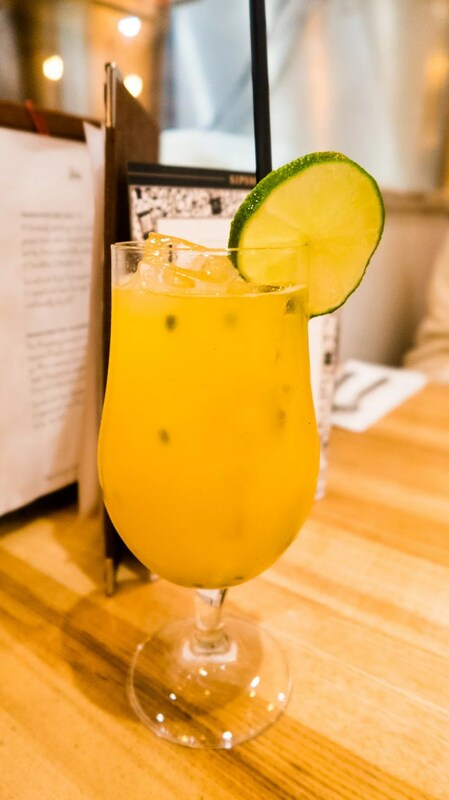 Mango juice is mixed with passionfruit syrup and then topped with soda. Fresh passionfruit is added and then a twist of lemon. This was sweeter than the Apple and Ginger fizz, so if you prefer a sweeter mocktail, I’d recommend this. There are a number of vegetarian items on the menu which state that the dish can be made vegan by removing the cheese or substituting with vegan cheese. Where this is the case, I will mention it. We decided to share a few starters to start the evening. I really wanted the caprese as I like buffalo mozzarella. 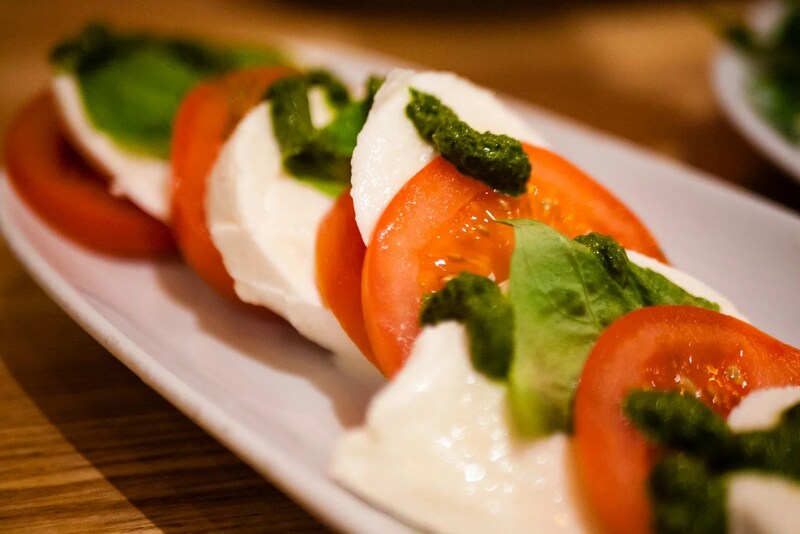 The caprese is served with extra olive oil and fresh basil. The tomatoes were sweet and flavoursome, exactly how I like them! This dish can be made vegan. We both agreed on the rucola salad as well to go with our pizzas. 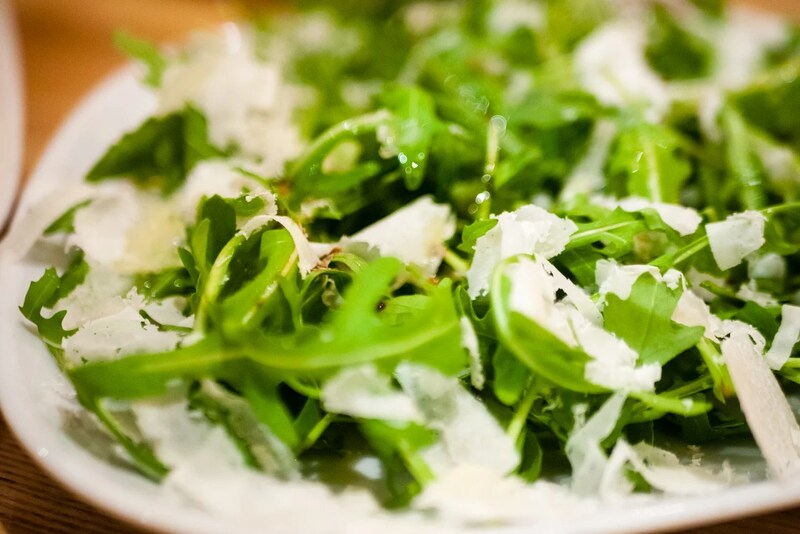 This salad contains rocket with shavings of Parmigiano Reggiano and drizzled with olive oil and balsamic vinegar. This salad is pretty simple but does what it says. The menu does state this is vegetarian, but it’s worth noting that traditionally, Parmigiano Reggiano is made using animal rennet. If this is an issue, double check with the chef. I was definitely going to order this, much to my friend’s dismay (I love aubergine, but she doesn’t). 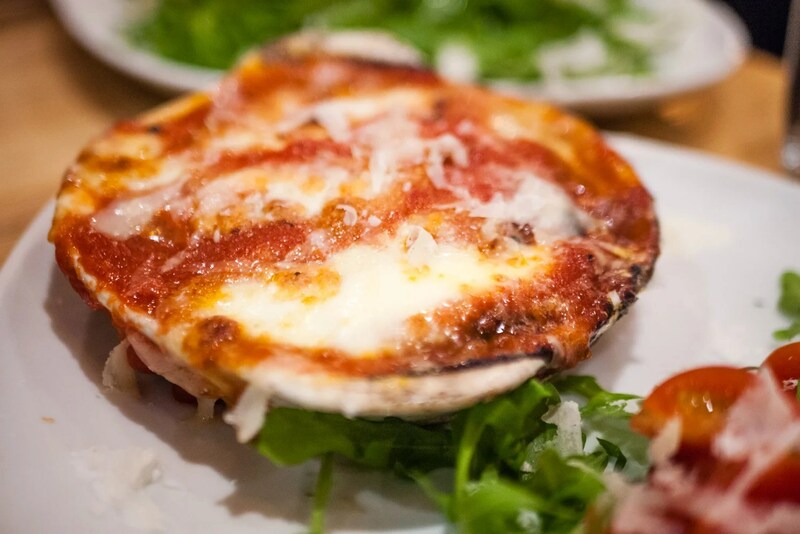 This dish contains baked aubergine with Fior di Latte mozzarella, Parmigiano Reggiano, San Marzano D.O.P. tomatoes and fresh basil. You may be wondering about the specifics of those tomatoes. The San Marzano label is used to describe the type of tomato and/or the San Marzano region of Italy it is grown in. The San Marzano tomato is sweeter with a stronger taste with fewer seeds and less acidity. The D.O.P. is an accreditation that the producer needs to get to certify that the tomatoes do indeed come from San Marzano. I really enjoyed this and even my friend tucked into some of it. That may be just because there were generous lashings of cheese on top, though. Having been recommended the arancini, my friend wanted to try this specifically. I suggested we get the Fritto Misto so we can try some of the angioletti and crocche. Arancini are balls of flavoured risotto rice, coated with breadcrumbs and then deep fried. The flavour changes so ask your server what today’s flavour is. These were really, really good that I think I’d consider ordering just these out of the three. Angioletti are strips of dough which are fried. Proove serve these not just as a savoury option, as in this case, but also as a sweet option available in the desserts menu. In a Neapolitan pizzeria, they are normally served as Angioletti Fritti, ‘Little Angels’, and are similar to croutons on a salad. These were ok, they taste exactly how they sound and were thus not that interesting to me. The tomato dip was so-so as well which didn’t help. 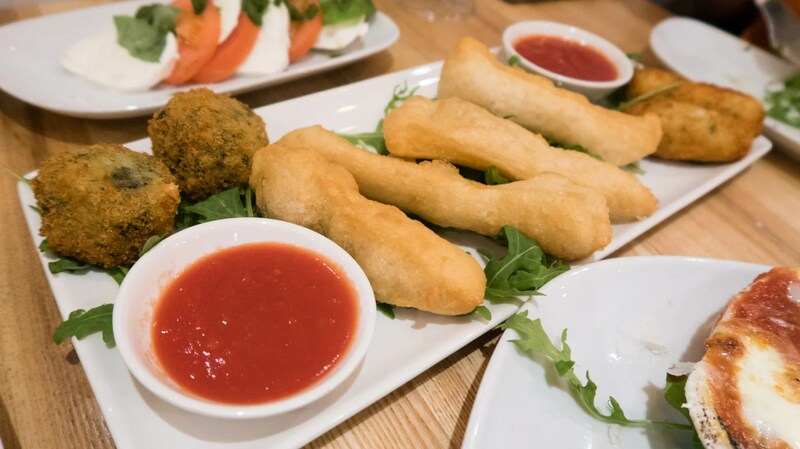 Crocchè originated in Naples and are made from mashed potatoes and egg, then covered in bread crumbs and fried. Similar to the arancini, the flavour of these can differ each day, so check with your server. I found these could have been crispier on the outside, but it enjoyable enough because who doesn’t like mash? 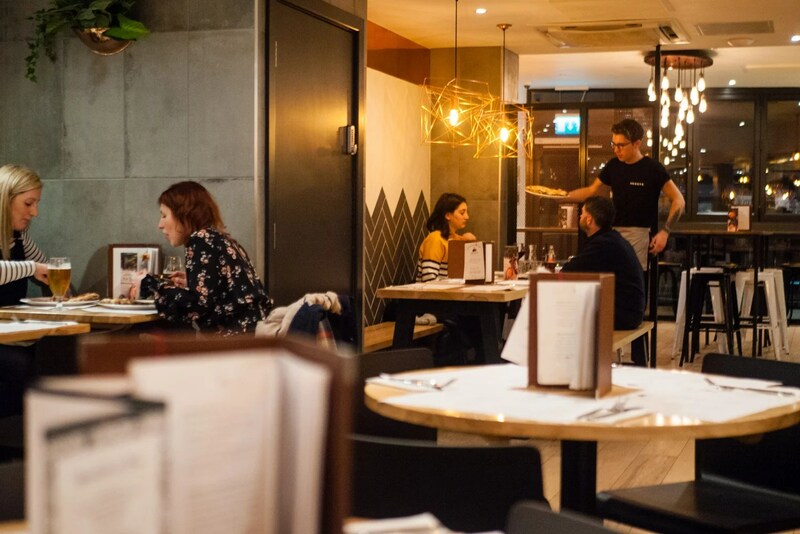 As mentioned at the beginning of this post, it took me a while to appreciate Neapolitan pizzas as I was used to a firmer base from which I can just slice through and eat with my fork. The Neapolitan style has a thinner base which just doesn’t compliment utensils; the trick is to not bother with them. Ideally, you should take the whole pizza and fold it, thereby trapping all the toppings inside, and then take a bite. In this way, it gets consumed sort of like a burrito. If you do like to share your food (like I do). you can opt to slice the pizza and then roll each slice from the middle towards the crust so that the toppings are yet again as contained as they could be. You can also create a pizza boat, where you fold the sides of the slice inwards. I have a thing for fennel, which is weird considering its aniseed taste and my dislike for liquorice. Fennel sausage is definitely a weakness for me and I was contemplating the Diavola for this reason. My friend and I compromised on the Calzone instead, as it also contained that treasured ingredient but without the chillies. The pizza was also topped with roast ham and onion, Fior di Latte mozzarella, Parmigiano Reggiano and fresh basil and served with rocket & San Marzano D.O.P. tomatoes. The pizza was a beast to look at and easier to consume as it’s already been folded over. I could have done with more fennel sausage in this pizza, or more fennel, but it was a flavoursome one that should appease meat eaters. The Verdue was an easy choice for both of us in a quest to reduce meat intake. 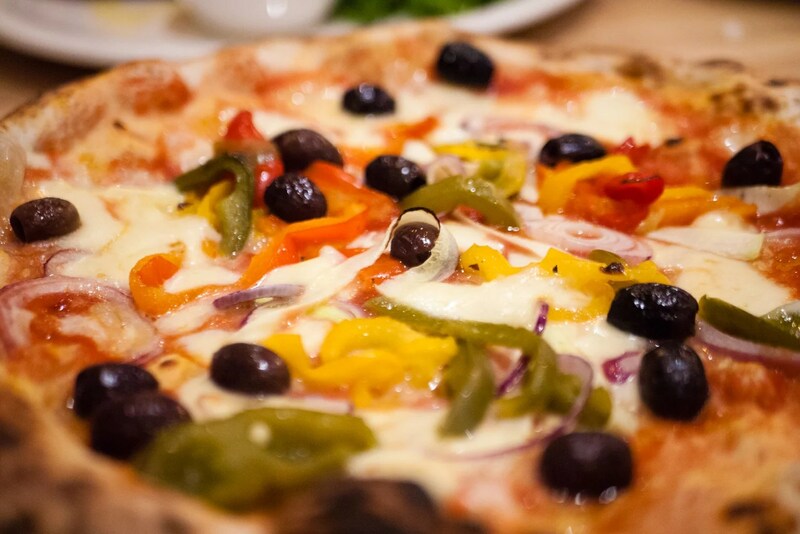 This pizza has courgette ribbons, roasted peppers, red onion, olives, San Marzano D.O.P. tomatoes and Fior di Latte mozzarella. It’s a good one if you like roasted vegetables and olives. I had this will chilli oil because everything can do with more heat. It’s worth noting that there is also offers a Vegetable Calzone on the menu with these exact ingredients priced at £10.20 if you prefer that. Both these pizzas can be made vegan. Our first dessert is the gelato, which you may be thinking is a dull option, but there is a story behind this. My friend LOVES hazelnut and she was telling me how she’d put Nutella on top of ice cream. The Nutella would set on top of the ice cream as it flowed down, much like how a drip cake looks. Intrigued by this idea, we asked our server if it could be done and the chefs gladly obliged to our (weird?) request. 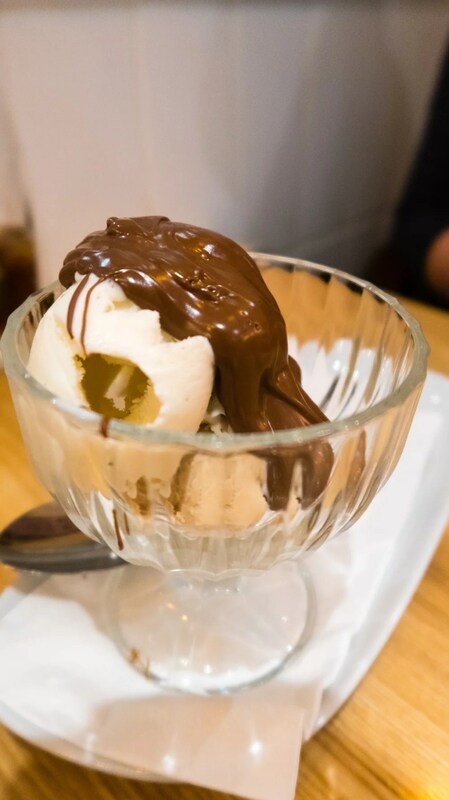 One scoop of vanilla and another scoop of Nutella and we were in hazelnut heaven. 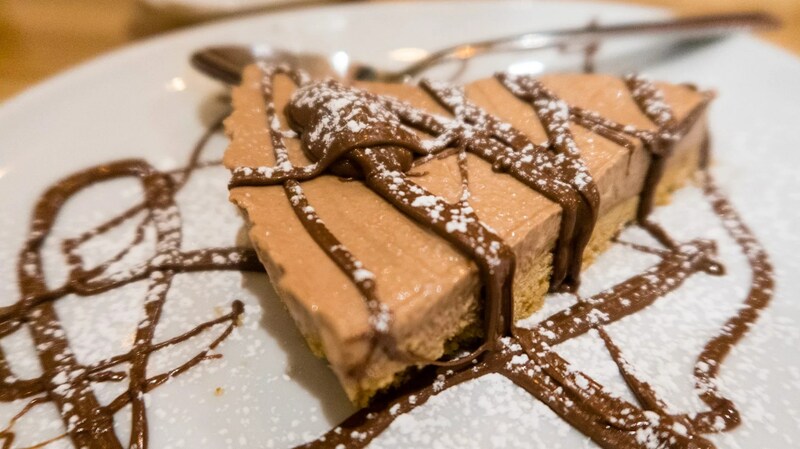 We liked our hazelnut gelato (with cheeky Nutella) enough, but this hazelnut cheesecake really took the crown. A Proove favourite, this is must if you love hazelnut. Hazelnut cheese filling with a biscuity base and lashings of Nutella on top with dusted icing sugar. This is actually one dessert you don’t want to share as it is surprisingly light and very moreish. 7.5/10, -1 for the tomato dip in the fritto misto, a bit bland and underwhelming. -0.5 for the slightly soft crocche. 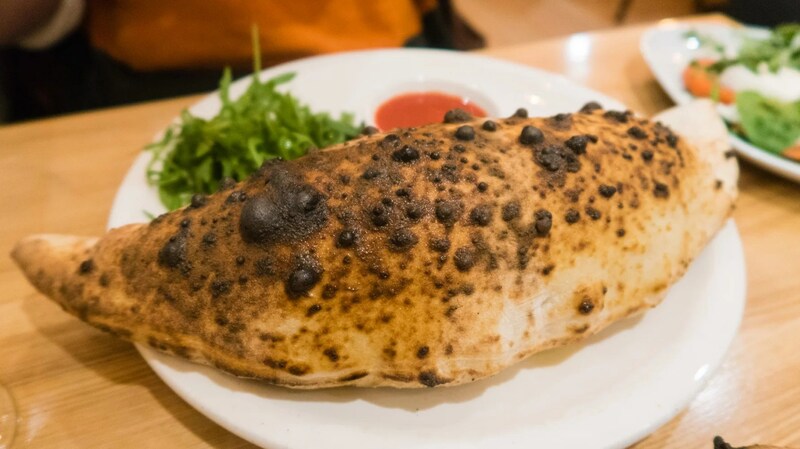 -1 for a lack of actual fennel taste in the calzone, considering this was a major reason for why I ordered this, I am disappointed, but you may be ok with this. The service throughout was impeccable, though, down to the cheeky Nutella on the gelato! The vegan options are fairly good and they can make their pizzas gluten free upon request. The desserts aren’t labelled with dietary requirements but I think the only vegan dessert is the sorbet, which is bog standard. It would be nice to see them expand this in future. Yes, I would gladly visit again.